It's that time of year again! Time for the "Twelve Discs of Christmas" giveaway! Join the Solution FM Morning Show at 7:25am beginning December 1st for your opportunity to win! Plus, not only will you win that day’s CD(s) but you’ll also be entered into a drawing to win a “Family Picture Package” from Beal Family Photography (valued at over $150! 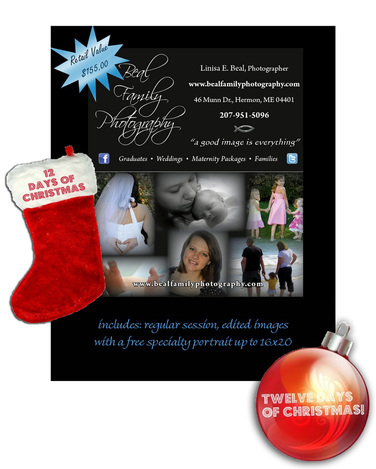 ), which includes a family session, edited images, and a free specialty portrait (up to 16x20)! Beal Family Photography will provide 1 Free Session for a family. That includes a minimum of 30 photos which will be edited and uploaded. The family will be given the copyrights to all the digital images and can buy them in high-quality from the Beal Family Photography website, or print them elsewhere. The family will also receive one (1) 16x20 portrait print. Retail value of this donation is $155. You know how it works! Just like the song, each day's prize gets better than the day before. On the first day of Christmas, you could win a copy of the Casting Crowns CD. On the second day, you’ll win Red’s CDand the Casting Crowns CD and so on. Below is the complete list. Thanks for Provident Label Group for their support.